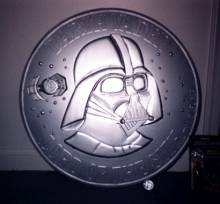 This large representation of a Power of the Force Darth Vader coin, used to present the coin concept to wholesale buyers, was likely made for and used exclusively at New York City's Toy Fair in 1985. As you can see, its quite a large (compare it to the production coin at its base) and impressive piece; qualities made all the more apparent when one considers how greatly it differs from its counterparts--the Boba Fett, Thall Joben and Logray coin mock-ups also presented at that year's Toy Fair event. For, while these three "coins" had their details silkscreened onto a flat background, the Vader "coin" is rendered in three-dimensions--mimicking the actual coin's detail, right down to the small stars in the background--and is finished with an even coating of metallic silver paint. Many of the pieces created specifically for Toy Fair reached a high level of craftsmanship and design. This is definitely one of the best of them.